“It’s the most wonderful time of year ” and once again we are here to show you how to enjoy Christmas in Athens . Athens is not the typical Christmas city and many may not have considered visiting Greece during the wintertime. However , Athens has grown to be a unique European metropolis with a unique urban style and a rich cultural legacy. All that combined can give you a great and different Christmas experience. Let us guide you through the many options you have to celebrate during your holidays here. Everywhere you go , in each square and every corner you will see Christmas lights and hear music coming from the many events that are running simultaneously . The city is full of music , theatre , cultural and educational activities, bazaars , exhibitions and action -aid actions. There are also many concerts and small plays on the squares and along the pavement walk that leads you to the Acropolis. Christmas in Athens can be an amazing experience. You can enjoy nights filled with Theatre and Opera at the Athens Concert Hall that offers shows for every taste. The Cultural Centre Hellenic Cosmos is an ultra-modern Cultural Centre and Museum that stands out for its innovative programmes. It has a dome-shape and offers virtual reality Theatre, three-dimensional films and the exhibition “Ice Station Antarctica” , initially presented at the Natural History Museum in London. A musical show for the children and the grownups alike will be staged at Michalis Cacoyannis Foundation. The Greek National Opera welcomes Christmas in Athens with the famous opera The Magic Flute and The Nutcracker, the most beautiful Christmas story. You can find concerts and do multiple activities also in Stavros Niarchos Cultural Foundation which is also and architecture miracle and besides the events it hosts on the dail it also has an ice skating ring for moments of pure joy. Athens is also a family destination mindfull for it’s younger visitors. The Christmas Factory is a classic for children. Little ones can to write letters to Santa or meet him in person. Santa Claus Kingdom is another fun option for a holiday themed day with indoor ice skating, rides, games and fair food. Every Christmas the National Garden trasforms into a fairytale forest with many educational activities. Last but not least , in Technopolis, in Kerameikos , there is also another SantaClaus factory with many activities but the grown ups will also have an interesting time there as Technopolis offers various shows and concerts in the afternoon. 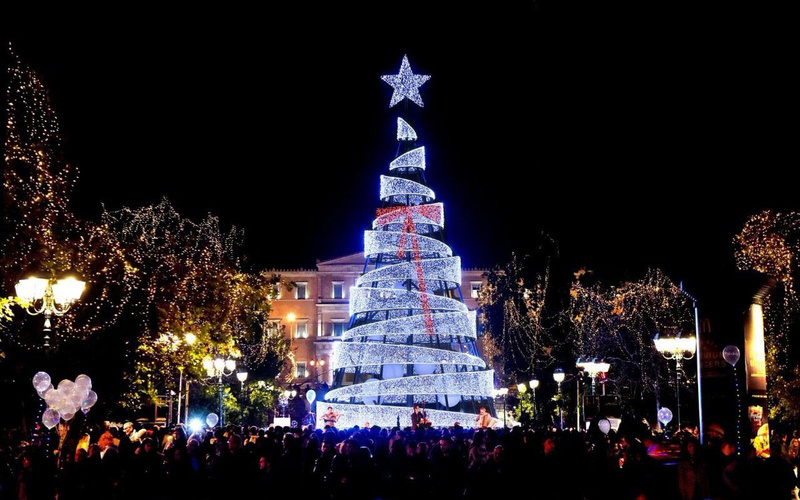 Athens is lit up and fully decorated to bring the Christmas spirit and give a magical vibe to everyone visiting it. You do not have to go further or search for something special to enjoy Christmas in Athens . The city and the streets celebrate for a whole month and even if you have nothing planned you can find many options in every corner . Whenever you see an angel on the streets you know that you are close to an event venue. Ask the angels and they will lead you there. If your Christmas apetite is not satisfied you can go by Little Kook cafe that is very close to the hotel and you will see a life-sized Christmas “neighborhood” . On December 21st , the longest night of the year , an event will be hosted at the National Star Observatory. And on 31st of December there will be 2 separate events in Syntagma square and in Thisseio. Of course, our staff and reception desk is here for you 24/7 to give you all the important information about the events, suggestions and help you with making the best plans to enjoy Christmas in Athens. Our rooftop bar will be operating and serving amazing drinks , cocktails , wine and champaign to those who want to spend their time more relaxed or to have a pre-party before heading to another event. You can see all the Christmas lights, the fireworks and the Acropolis from our rooftop. Lastly , we will serve traditional Greek sweets on the reception and the breakfast room and on the 1st of January we will have the Santa Claus Christmas cake , a long tradition which says that whoever finds the coin inside will have a lucky year.